We'll make sure to respond asap. Mens Size 11 Under Armour Highlight Football Cleats Silver & Gold 3000338-100. Shipped with USPS Priority Mail. This item is a sample issued by UNDER ARMOUR. Under Armour Limited Edition Shamrock Lacrosse Cleats. Lightweight, bladed cleats provide superior traction for quick cuts and explosive acceleration. UA ClutchFit™ is a “second skin” that molds to your ankle while you move, giving you powerful support & an incredible feel. Under Armour UA Alter Ego Highlight MC Dark Knight Batman Edition Cleats. Amazing cleats for any batman fan. The skeleton feet look on the bottom of the shoe is the best part. Amazing rare and hard to find shoes! Break through for the go ahead touchdown in the Highlight MC. Under Armour. Football Shoes. See pictures for more details. Shoe Category. Casual & Dress Shoe Style. Highlight Navy GRAY Football Cleats Honor Courage. NEW Under Armour. FREE SH in the US Only. Molded 4D Foam® footbed conforms to your foot's exact shape, eliminating slippage & reducing cleat pressure. Under Armour UA Highlight MC Football Cleats. UA PlasmaX plate powers your foot‘s natural motion for maximum traction & stability. 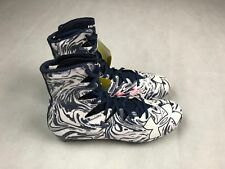 Under Armour Highlight limited ankle football Cleats camo 1275479-946 Sz 8.5. Shipped with USPS Priority Mail. Purple/Yellow1269693-571 LSU. UNDER ARMOUR Highlight Football Cleats. Under Armour UA Highlight MC Football Cleats. 100% Genuine. 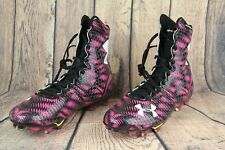 Under Armour Highlight Select Football Cleats Black/White USA Size 11.5. Shipped with USPS Priority Mail. Non smoking home and no pets. Under Armour Highlight - Black/White Cleats (Men's 14) - Used . Under Armour Highlight MC Football Cleats. UA PlasmaX plate powers your foot‘s natural motion for maximum traction & stability. Red / Baby Blue.